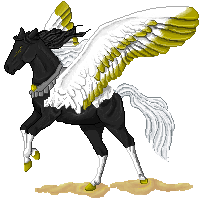 Sierra's sleek pegasus figured wandered through the snowy plain of the Steppe. She raised her hooves. Fighting was her thing. She was a soldier, one who would not be put down. Sierra would not give up until she had won. Midas was there with her, it was time for their spar. She snorted, pawing the earth. Her blue eyes gazed at the pegasus. Her breath appeared visible in the cold air, her sabino body stuck out, white markings lined half her body, her white wings spread out, casting a shadow against the snow covered earth. "Ready? "She didn't allow the stallion time to reply. She reared up, charging forward. Sierra came closer to the black and white stallion, aiming at his left shoulder with her teeth. As she neared him, in the blink of an eye she switched to his right side, reaching for his shoulder with her mouth. She swung around his rear, keeping a distance. Sierra breathed heavily, tucking her wings close to her body, trying to keep herself warm. She reared up, puffing herself out to appear larger. She stomped her hoof, pounding it into the earth. Sierra was strong, and she did not want to be embarrassed by this spar. Her eyes fixed before her, she waited for the winged stallion to make the next move. 1/1 Opening Attack 1/1 Sierra charges at the stallion, aiming to bite his left shoulder but at the last moment switched to the right side to bite. [Midas is already there if that's alright]One opening attack post, four attack posts, one closing defense. No magic or companions, just physical attacks. 800 word count max. Taking place at the Frost breath Steppe at Sunset. Since this was to be her first sparing, Midas simply followed along quietly; waiting for said girl to choose a position that would provide equal favorable environment. She led him to a frozen wasteland. A sigh arose to cloud air with heavy breath, wings tightened against sides—his only sigh of irritation. Midas despised all this cold. Partner’s energy was being spent pawing and twitching—honeyed orbs glanced over the quivering roan, reserved calm always upon his face. Energy was too precious to be wasted in effort of showing out. They separated and stood at a distance, body straightened; the metallic armored collar bumped against his chest with warm pulses. Its properties wouldn’t be used today, for this was training….not war. Eyeing each other for only a moment, she called out first, “Ready?” A responding smirk was the only appropriate answer obtainable, jaws parted with smile fleeing as the lady charged forward. Shifting weight to hindquarters, Midas steadied his frame and anchored rear weight to earth. Chest extended with readied breath and neck flexed at an angle with jaws opening to receive her attack head on, or flex upward portion sideways either left or right depending upon approach. She came, to the left—he adjusted frame to angle as such, and took note when slight change of direction was made. To the right! Too late to protect his upper shoulder blade from a smart nip, but not too late for jaws to swing round and attempt at landing an open mouth strike of his own along her backend portion. She slithered behind, rear jumped up with hindfeet snapping in the direction partner fled. Leaning sideways after landing from the kick, Midas twisted right. She had paused, he did not—body shot forward to meet her slightly taller frame. Rising up when distance had been closed, wings extended and thrust inward to attempt at flogging contact across upper portion. Daggers stuck air, each a dangerous weapon that had the potential to strike her. Rear leveled itself and found a balanced position to uphold bulk and any force that came against it. Neck remains tucked to protect throatlatch. Attack: Bites at Sierrra's spine/hindquaters as she runs past. Kicks in direction she runs past. Follows after Sierra runs behind, rears upon meeting with wings extended and flapping inward to strike along her shoulder/neck/or head. Forehoof's striking out with intent on clipping her should she rise up. Defense: Leveled and balanced while rearing, neck is tucked to protect throatlatch. Injuries: Teeth scrap, will lightly bruise along upper right shoulder blade. Sierra grinned at how Midas fell for her trick. She would have to try it again some time. But there was little time to think now, for as she ran past the stallion, her bite a success, he reached for her spine. She quickly bucked upwards as she did, so that she would smash his nose. But his teeth were already there, and a bruise began to form. A strong leg kicked out at her, but she easily avoided it, the hoof caused just a small bruise on her leg. Sierra snorted in agitation and watched as the stallion flailed his fore legs and flapped his wings as she reared. She ducked down, keeping her head low to keep from being hit by the flailing hooves. Putting all fours back on the earth, she spun round, throwing her back legs from under her and right at the winged stallions' unblocked gut. His fore hoof cut a small gash within her back from his flailing about. Now she was mad. When she had all fours back to the earth. She used her own wings to guard her self from the still flapping wings of Midas. Attack: As she goes by and Midas attempts to bite her spine/back, she throws her back up to slam his nose in. While Midas rears she ducks down, and bucks at his stomach. Defense: Lowers her head during her buck in order to keep from being hit by flailing hooves. When she is done with the buck she shields herself with her wings to keep flapping wings at back. Injuries: Small bruise upon spine and leg. Small gash on back/quarters. Her body fell willingly beneath him, almost altogether avoiding the beat of his feathers and flailing limbs. Growling under breathless exhale, the weighted brute fell forward just as she spun to meet his chest with tempered hindfeet. He saw her half spin coming and immediately started backpedaling with limbs and wings moving as one. Despite his best efforts, daggers collided with reinforced silver metal; thankfully Midas had half rose to avoid a high strike along unprotected cranium. The strength of her impact forced breath to painfully leave lungs, a sore spasm swam around in that region—breast bone would be tingling tomorrow….all he could do was be thankful that strong earth metals absorbed most of the shock. Snarling now, Midas used the distance between them to ignite his body into heaven. Heavy thrusts sired permafrost in all directions, hopefully causing bitter strikes on the senses and eyes below. Wings didn’t take him very high; instead he chose to rise eight feet before angling toward said opponent, with outreaching neck and forelimbed points. Muscles along his spine moved toward unison to arch feathers in an angle with tips nearly tucked, descending rapidly with jaws parted Midas aimed for striking spine with his blunt weight in hopes of knocking her from feet. Hindquarters tensed in readiness for the quick adjustment that would follow to regain balance, and jaws spread to reveal clean teeth and flexible bite should she choose to avoid his first maneuver. Attack: Rises to the sky, scatters permafrost everywhere. Angles toward using gravity and physical weight to slam into Sierra, hopefully to knock her from feet; teeth and neck at ready to move when she does. Defense: Wings are mostly tucked to protect them from either impact with earth or Sierra. Injuries: Sore breast bone, hinders flight muscles only a little. Sierra grinned as she felt her hooves collide with Midas. She watched as he began to lift himself within the air, eight or so feet above the frosty ground, and as he propelled himself up he scattered the snow in all directions. She quickly used her wings to keep them from her face. Midas tucked and began to hurtle back to earth towards her. His mouth opened, ready to bite her spine.Oh no you don't! She grinned, aiming to turn left, then quickly, just as the stallion came near, she backed up, using her wings to push her farther. The beat of her wings pushed the snow in every direction. She aimed a bite at Midas's left side. His neck to be specific. She reared, tossing her legs about, throwing them nearest Midas's neck and shoulder. Her eyes burned with fury. Sierra came back down, ignoring her current wounds and waiting to see what Midas had in store for her. Attack: While Midas was shooting towards her she faked a left and swung back, using her wings to blow snow everywhere. During this she also attempts to bite Midas's neck on his left side. She then rears and flails her fore legs at his left side. Defense: Uses her wings while he blows the snow everywhere to shield her eyes. Injury:None in this post specifically. Short post. Something's wrong with your table. It's all weird when you go to post a reply. Again, his attack was mostly averted. A different tactic fluttered to mind, Throats general was prepared to act in adjustment. Gravity dipped frame dangerously forward, heavy beats kept his bulk from falling so fast that limbs wouldn’t be able to handle the shock. She moved left and he charged to follow—mating icy earth with flailing golden pistols. Body leveled out, riding parallel and at a swift hover. Her bare teeth took aim at his shoulder, blue body rose to rain tense limbs upon shoulder muscles. Right hoof struck true at the shoulder and her teeth slashed inches from his forelimb. Part of his right shoulder whelped pain when the surprise of blow disappeared. Taking little to no thought toward minor injuries sustained, Midas tightened pectoral muscles. Until each had pulled wings shut whilst he hovered, landed and pushed with hindquarters from ground again. All happening in a split second—cranium tucked chin to throat-latch. The blunt part of left shoulder faced her abdomen, muscles flexed and chiseled like the side of a hurling boulder. Taking the likeness of a bullet flying from a gun he kept coming, determined to strike a blow that would ideally thrust body from feet. Attack: Touches down and rides the ground at a canter to follow her movements. Wings and head tuck, shoulder is facing her side, (belly side.) Planning on butting shoulder first; using speed, hindquarters thrust ground and maintain momentum into what he hopes is her body. Defense: Wings and chin are tucked. Body is ridged and tense, ready for impact. Injuries: Scrapped flesh on right shoulder, slightly bleeding. She watched in success as her light hoof struck Midas's shoulder. She put all fours back on the earth, watching the Throat general's every move. He cantered along once he touched the cold earth. As her blue eyes tracked his movements, her legs worked furiously to avert the stallion. He tucked his head to his throat, bracing himself. Only then did Sierra realize it was too late. His black and white body collided with her side, the only thing she could do was widen her stance a bit to keep herself from tipping over and falling. As he rammed into her, Sierra swung her head back towards the stallion. She bared her teeth and aimed a bite at his forehead or his cheek. Her legs moved her to the left of the stallion, keeping just enough distance to bite him before she withdrew, her deep blue eyes focused upon his pupil-less golden eyes. She flicked her ears back, keeping herself as far from the stallion as she could, hoping not to be struck. Sierra's mind planned her next attacks, she was unfocused and open to strike. But with a quick jolt she realized her stupidity and focused back on the battle, scolding herself for her flaw. She cantered round and round the stallion, waiting for his next attack. As he rams her, she aims to bite his neck or cheek. Keeps self far from Midas and keeps self as small as possible. When rammed, widens stance to keep balance. Small bruise to rib due to collision. Their bodies collided, a grunt sound thrust from chest when they met. Instantly the impact forced out what little air remained in his lungs. He wasn’t done by far though. This lassie was keeping instincts busy. Her body sidestepped but fatefully retained balance, delicate blue head swung round to graze teeth high across his poll in defiance. Flattened bite took dark hairs from mane when she withdrew, and shifted body toward his left side. Floating across earth with dancing dangers Midas swung with her, taking smaller size to an advantage for speed. Rearing when able, golden daggers struck air leaving him open to lean forward with attempt at scarring withers or topmost portion of her patched neck. Body rose rose high above the woman in an almost side straddled position. Hooves swung outward, attempting to capture said girls frame between empty spaces and submit a clean strike to withers by extending neck further. Wings remained firmly tucked, and hindquarters tensed toward keeping a firm balance whilst he leaned forward. Attack: Follows her movements, where she goes he trails close behind. Rears up with forelimbs flailing, hooves spreading to circle her frame; neck stretches with muzzle extending to strike along her withers or topmost part of neck where mane meets flesh. Defense: Wings are still tucked; body is leaning forward with hindquarters retaining balance. Injuries: Cut mark along his poll. Sierra grinned as her attack was successful. The smaller stallion moved with her as she moved. As the black and white stallion reared, his golden hoof scraped down her withers. Sierra winced in pain, but she wasn't ready to give up yet. She flung her leg out, hoping for it to collide with Midas's stomach or legs. She quickly placed all fours back onto their earth with such grace and speed. She kept her wings tucked, glancing back at Midas. She circled back around, keeping her head tucked close to her body. She stuck her front legs out from under her one at a time, hoping to strike Midas in the legs or trip him in some way. Once she was done with her first few attacks, she galloped away from Midas, kicking up permafrost in his direction. Sierra's blue roan body was larger than the stallions', he had speed on his side. But she had strength on hers. She launched herself into the air, her muscles working hard in order for her to go high enough off of the frosty earth. She snapped her wings out, soaring just high enough so that she was just above the winged stallion's back. When she was almost above him, she angled herself and folded her wings, allowing her to fall a few feet or more at the stallions' back. She stuck her legs out, hoping they would dig into his back between his wings. If she was successful it would cause the stallion to the ground. If he moved, she'd be the one to go into the ground. While Midas rears she tries to scrape his unprotected stomach or his legs. She then runs from him and circles back around, coming at him while striking her front legs out one and a time so that she may jab him in the legs or trip him. then kicks permafrost in his general direction. After that she leaps upward, soaring a few feet above him. She's a few feet away from him, and she angles herself at his back, diving downwards at him, hoping to scrape her hooves between his wings, which would force him to the ground(her hooves wouldn't go point first though). She keeps herself far from him while attacking, and when she goes to strike her hooves out she keeps her head tucked. The lithely moving girl decided to bridge past traditional ways of battle. Midas felt left forehoof collide with flesh, though it seemed only dagger would fall with clean strike. Hindleg rose to knock his attempts away, the hefty thrust pushed against soft belly—that would later create a nice hoof print bruise. A single snort of discomfort was the only sound the general offered her, the other was gashing teeth across bare air as she moved away and he strained to follow. Crashing earthbound Midas spun across heel, shifting buttocks in her direction. She came again, he was ready by now; her circling had given him an edge of preparation. Balanced and watching from the sides, hindquarters rose up in two half bucks that bounced his front half forward a few steps, before fully thrusting in a full out buck with head leaning forward to almost kiss earth. This ungodly cold was annoying, had they not been fighting to keep blood moving; he might have noticed it more. As it stood, the ice crystals she shot up in wake of a gallop fell across his spine harmlessly. Midas settled solidly, breathing came in great exhales now; each smoky cloud circling his face before misting out of visibility. Masculine body danced round facing her now, spying an opening of wings as his sparing nymph took flight. Limps followed for only a few steps before realizing she had twisted and was going to apparently strike from above. Wings ached to join in a sky flight, but another more simple idea formed. Knowing only a moment lapsed between a decision, he waited anxiously until her shadowed body drew near…then…when the moment felt right Midas burst forward with a chancy expending of energy. Gallop lasted only a moment before he flung forward with tense forelimbs, bracing already sore breast muscles to absorbed impact and thrusting again with hindquarters aiming to strike at any portion across head, neck, or shoulder that might happen to still be coming. Attack: He responded to her first attack with two half bucks and a full buck. Then when she came at him from above Midas lunged forward in a gallop to change position and drove head down into another full buck. Defense: Wings are still closed. Body is braced and level. Injuries: A bruise will form where she stuck him in the stomach. Sierra had barely enough time to react. She stood up straight and had little time to react to his buck. Golden hooves flew a little too close to her, as she reared her hoof landed upon a patch of ice and she ended up with a golden hoof colliding with her shoulder. With a wince she turned to the damage, skin had only been scraped. It was nothing but a scratch to her. She swore silently to herself as two more half-bucks came flying at her. With ease she dodged the first, but the second one grazed her chest. Sierra watched at Midas galloped out of the way of her aerial attack, and she hit the ground with such force. She quickly tucked her wings against her body. As she hit the earth permafrost flew in all directions during her landing. She glared at him, anger rose within her. But she was quick when he aimed his next attack. She angled herself away, the golden hooves of the stallion touched her neck in the most gentle manner, leaving no bruise or cut. She huffed, her breath appeared as smoke, disappearing as it misted. She finally stood up. "Alright,"she said kindly, a smile cam across her lips. "I think we've had enough sparring for today. Let's return home. "She swished her tail and deemed the spar to be over. Keeps wings tucked after the aerial attack and keeps self balanced. A scrape on shoulder, very small scrape on chest. No further connection was made. Both where breathing heavy, skull turned to regard her with remained excitement and readiness. One glance told him that their match was over, they both had seen enough of each other and perhaps learned a thing or two. Mane and tail caught wind and snow, body was still warm from all their movement. Each would have a sore part on flesh tomorrow, but that was part of it. “Alright," slowly the cold began to seek in, heartbeat was starting to slow; her smile felt warm and tugged a responding one from chilled lips. "I think we've had enough sparring for today. Let's return home." Home. Now that sounded like a fantastic idea. Grinning from ear to ear Midas said, “Better race the wind, my bones are already starting to freeze malady,” tone was husky from all the exercise but light with humor. It stretched muscles and worked parts of one’s body that normally wouldn’t get worked. Neither would be too happy about the cuts and scrapes they had obtained come morning. Dashing forward into a canter, Midas worked up a little speed and hastily took off; each beat caused him to resist in biting through his upper lip as shocking chill tore at warmed limbs. Summary of sustained injuries: Teeth scrap, will lightly bruise along upper right shoulder blade. Sore breast bone, hinders flight muscles only a little. Scrapped flesh on right shoulder, slightly bleeding. Cut mark along his poll. A bruise will form where she stuck him in the stomach. OOC: Sounds good <'3! Hit me up with a message sometime when you want to start a thread. Your girl earned one 1 skill point! I'm very confused, Sierra attacked 5 times? It should be 4 attack posts for each of you, one closing defense only post for whoever attacked first. By my verdict MIDAS is the winner. - 1| Attack: bite – you’re going from the left to right shoulder, but that’s a lot of horse to move around that fast. It’s not possible she could do it in the blink of an eye. + 1| Defense: kicked – although you say you avoided it so this is confusing. - 1| Defense: wing block – this would have been viable if the timing had been correct, you blocked this long after he placed it. + 1| Defense: gashed on back – it would be more of a bruise then a gash, hooves aren’t sharp. - 1| Defense: kicked in chest – coming into her kick would have given her damage and reduced his. Kicks get their strength from extending out, and he would have had most the weight of his body pushing down on her lifted hind legs. Don’t see how you can backpedal if you were already in process of coming down, as you say. - 1| Attack: rearing – again she is not near him and you did not describe repositioning. Your opponent is currently moving but you are standing still. - 1| Defense: took charge – she could not just widen her stance and be fine, she’d be bruised and knocked a bit off balance/stagger around or at least be pushed a bit. - 1| Defense: hoof to shoulder – not sure where this hoof attack came from? + 1| Defense: taking half his bucks – it’d make more sense she’d dodge the second, rather than dodge the first and take the second, as she should be away by then. - 1| Defense: took his buck – if you fell he would have missed as his aim was high. - 1| Ended fight not standing. Comments: You had some great eye for attacks and defenses, but you need to explain how they work and why they work a bit more. Just dodging something doesn’t make it viable unless you explain how you were able to dodge it. You also need to work on putting description into your posts. Everything seemed very short and almost rushed, so you lacked any emotion what so ever which made this fight less enjoyable to read, and it meant that your injuries, attacks and defenses were all very simple. Expand more on all the ideas. You took a hit? Cool, what will that do to you physically, how much does it hurt, how does it make your character feel, will it hinder your movement/plans now? Comments: You had a lot of great attacks and defenses and a good eye for timing. Sometimes you need to work on your positioning, as you took some attacks that didn’t make sense for the situation. Also remember to play upon your injuries and breed differences more. The biggest issue here was your lack of emotion. I felt nothing this entire fight and would have loved to know more about Midas’ thoughts and feelings. The manner in which you write also seemed choppier than usual. Not necessarily rushed, but everything was very clipped and short, brief and almost fragmented. It made it harder to read and follow, along with the way you kept it all very dry and lacking much detail – sometimes you just referred to Sierra as partner. So work at putting more feeling in and you’ll do great.